The Flash: Season 3, Episode 21 "Cause and Effect" Review – AiPT! So Savitar is Barry and Barry is Savitar. How Savitar came to be in the first place comes back to the old question of which came first: the chicken or the egg? In this week’s episode, we’re in total paradox city as the very methods Barry eventually uses to defeat Savitar are what create him. In prior episodes, while Barry’s been in the process of time traveling, he’s occasionally spotted a second Flash running beside him. Those “time remnants” or temporal duplicates were explained in Season 1 by Harrison Wells/Eobard Thawne as the Speed Force’s way of preventing further paradoxes. While H.R. helps Tracy Brand construct a Speed Force Bazooka, Cisco immediately addresses the problem of Savitar sharing all of Barry’s memories. What if he blocked Barry’s short-term memories from becoming long-term memories, so future Savitar wouldn’t know their strategies? One would think this plan would require a lot more consideration and a lot more time to even practically construct a machine to do this even if it were a good idea. 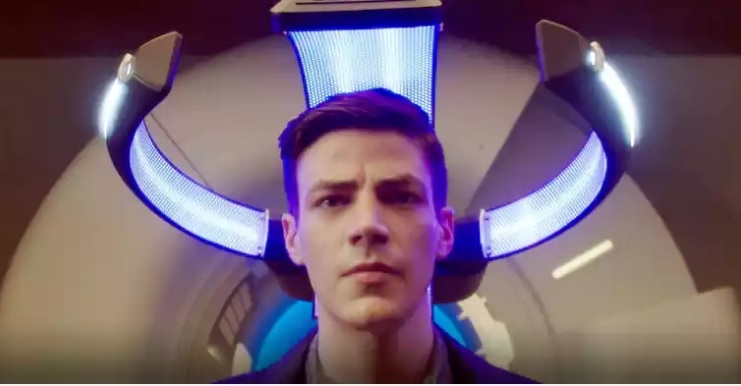 But commercial breaks eat up more and more screen time these days, so less than a minute later, Barry’s resolved to undergo the procedure and a machine to do it is up and running. Too bad Caitlin, the brain expert (and anything else the plot requires her to be an expert in) isn’t there to make sure Cisco doesn’t screw this up? Oh, well. No time. And voila! A few seconds later, Barry has lost most of his memories. Way to really blow it, Cisco! Barry doesn’t even remember his own name, but quickly decides he prefers to be called Bart (Ah, I see what ya did there, Flash writers). One minor mishap involving a little less than ethical perjury while testifying against Heat Wave’s even sillier pyro successor aside, Barry — or Bart — actually manages to handle his amnesiac existence quite well. He’s even smiling…a lot. This leads Iris to wonder, maybe Bart is better company than Broody McGee. I mean, it wouldn’t be so bad if they didn’t restore his painful memories of his mom’s brutal murder. Of course they also didn’t tell Bart about he’s a speedster, which he quickly rediscovered while kissing Iris. Though that does put him one up on Savitar who’s also lost his memories. Oh, and, as Team Flash discovers when Killer Frost shows up at S.T.A.R. Labs, Wally doesn’t have his powers because Savitar is responsible for his powers and amnesiac Savitar never did that, so… Wibbly wobbly, timey wimey. Turns out Killer Frost just wants to collaborate to restore Barry and Savitar’s memories, which I really think the team should have considered holding off on upon discovering Savitar too was now vulnerable. Barry and Savitar aren’t the only ones whose memories Cisco tries to jog. While collaborating with Caitlin again like old times, Cisco tries to remind her of the good old days when it was just him, Caitlin, faux-Harrison Wells, Hartley…and Ronnie. Remember Ronnie, your late husband. Good times! Killer Frost briefly drops her supervillain act and gets caught up in the moment, revealing our Caitlin is still in there before snapping back into villain mode. When the threat Bart accidentally let free during his perjured court testimony starts wreaking havoc on Central City, Bart dons The Flash suit to try to save the day. But, by the time he gets to the scene, it’s clear he lacks the experience necessary. So the team electroshocks his brain with the device Caitlin helped build to fix the problem. And…it doesn’t work. He just needs to remind him of a visceral memory to finish the job, so Iris reminds Barry of the night when they were kids and she comforted him while he was crying about his mom, the night she fell in love with him. She wishes she could take all his bad memories away but knows, for every bad memory, there’s a good memory. It works. Barry’s memories are restored. And now that Savitars are too, Wally’s powers return too. The crisis is over — like so many things on this show — quickly. The team makes one more appeal to Caitlin to stay. Julian even says he loves her. But Killer Frost says she never loved him or anyone else in the group, and then makes her frosty exit. Finally though, H.R. and Tracy have good news and bad news. After a kiss they shared sparked an idea from Tracy, she’s successfully built her Speed Force Bazooka. The only bad news is it requires more power than is used to fuel our sun. Some more good and bad news is the solution to that power dilemma may lie with King Shark. I have to admit, as much as I’m not feeling this Savitar as Barry reveal, the time remnant explanation is more interesting than what I’d expected. Still, this episode benefits from being Savitar-lite. The biggest failings of the episode are how quickly the team embraces such an obviously problematic idea and strap Barry into the chair without any animal trials or anything. I thought these people were scientists. And, once armed with the information that a supervillain as threatening as Savitar was vulnerable, it’s weird that nobody expressed any serious interest in exploiting that advantage. The whole point of the experiment was to affect Savitar’s memories, and that part actually worked, just not the way they planned. It was also nice to show some of our old Caitlin beneath Killer Frost’s exterior. Not a single character raised any concern about the ethics of setting up Bart to perjure himself in court.